Home » Projects » Is That Pontoon Project Right For You? Is That Pontoon Project Right For You? Our family has been restoring an older pontoon boat for the past several months. We found that the original canopy cover is still in remarkable shape for almost 30 years old, although faded from years of sun exposure. With new carpet and matching boat seats, the only thing that stood out like a sore thumb and showed the age of this boat was the canopy cover. After researching, it seemed like the best choice for the material we have is the fabric paint. Not knowing how much we’d need, or the outcome, we started out with three cans of navy blue fabric paint by Simply Spray. 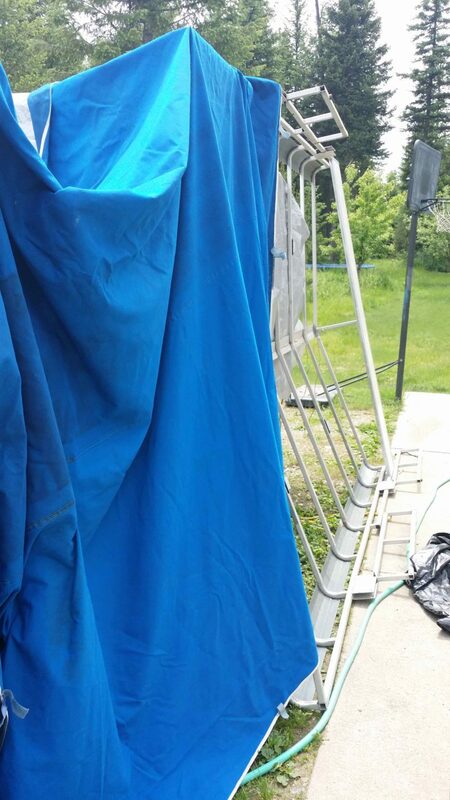 I stretched the canopy cover over the canopy frame and made sure it was clean and free of excess lint, dust, or oils. I had read reviews where people had difficulty with this particular paint, so I thoroughly read through all application instructions before I did anything. Following the instructions explicitly, I found that 2 of the three cans sprayed their contents very well. Coverage was satisfactory for the 8oz. cans I ordered. The third can acted a bit finicky as I could not produce a nice conical shaped spray like the other two. Instead, it seemed to shoot out in more of a concentrated stream, which did not give nearly as good coverage as the other two cans. Starting with three cans however worked well for us as it gave me a more accurate idea of just how much paint was needed to cover our entire canopy. Although the color is perfect, we also found that it is going to take two complete coats to adequately cover the canopy. All in all, this has been a good product. When used correctly, it does as stated and taking in the fact that this is really the only feasible option for a ‘paint-type restoration’, bumps it to ‘great’ status. ***This post review is pending and is scheduled for a July posting.